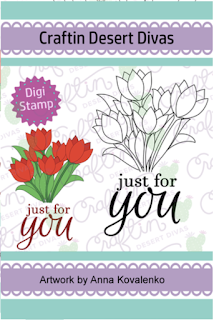 Today I'm sharing a newly released digital stamp from Craftin Desert Divas. I love flowers and was delighted to the Just For You digi in their store. This was a quick and easy card to make. 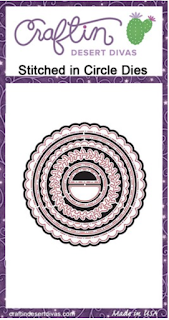 I printed the image on Neenah Solar White and used only 2 color families of Copic Markers to do the coloring. For the flower petals, I used RV52, RV63, V05 and for the leaves and stems, I used YG11, YG13, and YG17. I also brought in a couple of Prismacolor pencils to enhance some of the areas, but really nothing drastic. I used the Stitched in Circle dies to cut out the image and layered on a piece of patterned paper from my stash. I adhered all the layers to a 4.25 x 5.5 card base. Lastly, I embellished with a few Nuvo Jewell drops in the colors Morning Dew and Key Lime.